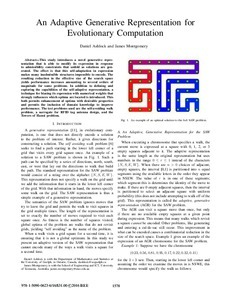 This study introduces a novel generative representation that is able to modify its expression in response to admissibility constraints that unfold as solutions are generated. The effect is that this self-adaptation in expression makes many inadmissible structures impossible to encode. The resulting reduction in the effective size of the search space yields performance increases amounting to several orders of magnitude for some problems. In addition to defining and exploring the capabilities of the self-adaptive representation, a technique for biasing its expression with numerical weights that strongly influences which optima are located is introduced. This both permits enhancement of optima with desirable properties and permits the inclusion of domain knowledge to improve performance. The test problems used are the self-avoiding walk problem, a surrogate for RFID tag antenna design, and the Towers of Hanoi problem.